Strap yourselves in, this weekend in Brisbane is going to be huge (okay, I know I say that every week but that's because it's always true!) This weekend we are looking forward to drinking champagne at the 2017 French Film Festival, doing the Irish jig at one of Brisbane's biggest St Patrick's Day parties, getting our groove on at Cooly Beachfest, and getting saucy at Kettle & Tin's annual chilli cook-off. With the perfect balance of high-energy activites and laidback delights, this weekend in Brisbane is looking pretty good (well, at least from this side of the hangover...). Cocktails by the harbour are our absolute favourite way to ease into the weekend, and this week, Fiction Bar & Restaurant is combining both, (so it’s basically the best Friday night situation ever). They’re serving cocktails made from Baron Samedi Spiced, and come Friday 24 March, you can experience one from the lovely Baronettes themselves. 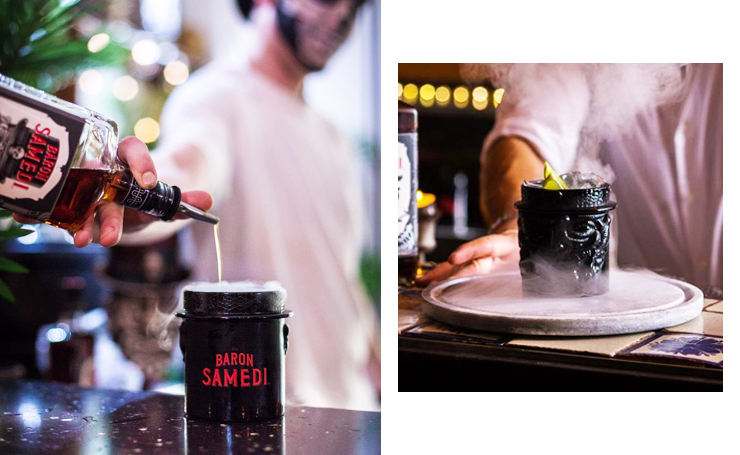 At the bar, there’ll also be Baron and mixers and signature Baron Samedi cocktails made with the Caribbean rum, which has flavour notes of vanilla, cocoa, cinnamon and clove vetiver. The cocktails are all pretty damn delicious, regardless of whether you order the Summon the Baron, Coco Voodoo or Haitian Punch. To sweeten the deal, Jo Doyle will be playing all night long. Want more from Baron Samedi Spiced? Check it out here! Gallic cinema is in the spotlight during the Alliance Francaise French Film Festival, which is returning to Brisbane once again with an eclectic selection of films. Telling a variety of different stories in a myriad of voices, the AFFFF is a vibrant celebration of the thriving French film industry. My personal picks: the Marie Antoinette-centric Farewell, My Queen, adventurous biopic The Odyssey, and A Bun in the Oven. The full 45-film line-up can be viewed online to make planning your night at the cinema as easy as possible. H&M is throwing a party to celebrate fashion, women in business, personal style, and a new way of thinking about #ladylike. The even is hosted by Elle Australia’s very own editor-in-chief Justine Cullen, who will be joined by fashion magnates Margaret Zhang of Shine By Three, Lucy Feagins of The Design Files, cake creative Katherine Sabbath and H&M sport ambassador Amanda Bisk. If you’re not sure what to expect, think more along the lines of Lean In as opposed to The Devil Wears Prada. And to add to the fun, there will be a DJ, treats, refreshments, and H&M’s new Autumn collection available for purchase. Score! Details: For info and to register, click here. We are fans of a classic pub-crawl, but sometimes we feel they lack something vital. Food. That’s why the team at Brewsvegas has put together a MASSIVE progressive dinner pub-crawl! Starting at Archive Beer Boutique for your starters, and then moving on to Brisbane Brewing Co. for a hearty main, following it up with dessert at Catchment Co., and finally finishing up for a cheesy nightcap at Bosc. You’ll be well and truly stuffed (and tipsy) by the end of the night and may have to crawl home too. Time to prove once and for all: is the ‘West Side’ really the best side? ‘OY, WITH THE POODLES ALREADY!’ Personally, I’m a major Gilmore Girls junkie. What’s not to love about characters that you love (and sometimes hate) like best friends? If you think you know as much about Gilmore Girls as Paris knows about literally everything ever, then head over to Little Clive for an evening of snacks, drinks, and a room that will probably divide itself into #teamjess and #teamlogan in the first 15 minutes (because no offence, but is anyone even #teamdean these days?). These trivia nights are super popular so make sure you register asaps so you don't miss out! When you knock off on a Friday arvo it’s so easy to just roll home and crawl into bed… But Netflix can wait! Because when one of our favourite local bars decides to throw a southern themed party, you’d be crazy to miss out. With slow cooked BBQ treats from 4pm, Buffalo Trace Bournon pouring, and rockabilly and blues (courtesy of Colt Seavers & The Rockabilly Road Band) from 5:30pm, this is a cracker way to wind down the work week and kick start the weekend! If you really can’t wait until knockoff, head in from midday when Fortitude Brewing Tap takes the reins. St Patrick’s Day is the one-day a year when we’re all a little bit Irish, and Finn McCool’s wants to celebrate that. They’ll be serving a full traditional Irish breakfast from 10am to get your belly ready for all the drinking that’s to follow. And with plenty of live music and beer flowing all day long, don’t be surprised if you try and jig along with the Irish Pipe Band. Holes N Hopes has made it’s way up to the sunny state this weekend for Brewsvegas and we couldn’t be more excited! Starting off at the Victoria Park Golf Course you’ll work your way through all 9 holes with a Modus beer in hand and a golf cart to make sure you don’t actually do any physical activity. Head back to the club’s bar for course prizes and the announcement of the lucky winner who will be taking home a KEG of beer! Cute golf outfits optional (but recommended). I don’t care if the weatherman says summer is over – I am not ready to say goodbye to the beach or to music festivals. Lucky for us, the festival gods have finally heard our prayers and have blessed us with Cooly Beachfest – an all ages festival held in beautiful Queen Elizabeth Park at the beginning of autumn. Headlining the inaugural event will be Australian juggernauts The Rubens followed by The Beautiful Girls, Dorsal Fins, Bec Sandridge and The Vanns. With the stellar line up of Australian favourites, food and market stalls and fully licensed bars - Cooly Beachfest is helping us hold onto summer for a little bit longer. Stone & Wood is taking over The Old Museum and hosting Brisbane’s ultimate backyard bash to raise funds for Oz Harvest and celebrate Brewsvegas! The free garden party will feature refreshing brews (including an exclusive Pilot Batch release especially for the party), a convoy of food trucks serving up delicious feed, and a selection of local market stalls. Add to that killer tunes courtesy of vinyl DJ’s ‘Your Mates’ and a The Belligerents gig (tickets going for only $20!) and you’ve got the best backyard party in town. All of this is to support Oz Harvest and the work they do for Brisbanites in need. If you have lunch plans this Sunday then make sure that it’s at Madame Rouge. Our favourite French bistro is now hosting jazz afternoons every Sunday! Each week will feature a new live act to keep you relaxed whilst you enjoy a cocktail (or two or three…) and a long, beautiful lunch. We’ve officially found the best way to wind down the weekend! Suncorp Stadium isn’t the only sporting arena in Milton, thanks to the Newstead Breing Company’s new residence on Castlemaine St. If you spend every Olympics yelling at the athletes and claiming you could do better, now is your chance to compete for glory at the 2017 Beerlympics. Held in the carpark, teams of four will need to dodge all sorts of unfriendly fire and make their way through the giant inflatable obstacle course the quickest. There will be food, beer, and plenty of chances to get messy. Make sure you register so you don’t miss out. Make sure you pen this one in your planner because you won’t want to miss it—Hot Dub Wine Machine is heading up to our neck of the woods to appreciate the bloody good wineries we are proud to call our own. Unwind amongst the grapevines with a carefully curated line-up of artists, food, activities, and, most importantly of all, wine. With the sounds of Hot Dub Time Machine, PNAU, Young Franco and more keeping the vibes sky high, you’ll be able to indulge in epicurean delights, gourmet treats, and get low on the dance floor. Check their website for all the best tips on transport. Editor's note: Baronettes Sampling event is proudly sponsored by Campari and endorsed by The Urban List. Thank you for supporting the sponsors who make The Urban List possible. Click here for more information on our editorial policy.